Pesto sandwich is a quick and easy breakfast recipe with some leftover pesto. If you like pesto flavour this sandwich is for you. Sauted vegetables and pesto makes this sandwich yum yum. Whether it’s Store brought/home made pesto this sandwich is a keeper recipe. I am not a big fan cereal. Sandwich is my life saver during many busy mornings. When I run out of time or wake up late, I immediately reach out for a bread loaf. My sweet tooth craves for spreads like Nutella or cream cheese spread or jam. I got this Pesto Sandwich idea from my co-sis. When we visited them, she prepared this for breakfast. I loved its taste and its a perfect way to finish off the leftover pesto after making pasta. Sauted vegetables gave nice crunch to the pesto sandwich with a mild touch of sweetness from onion and sweet mini pepper. One good think about pesto sandwich is, it tastes yum even if you have the sandwich after a while. I am so addicted for this taste anytime I over eat and reduce my lunch. Yum… pesto is very versatile.. unique flavor that goes very well with everything naa. Very simple and healthy sandwich. Love it ! 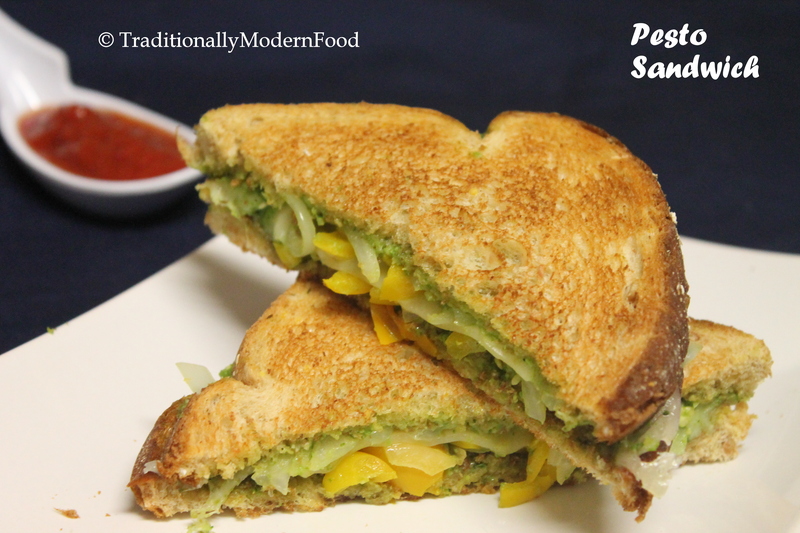 Pesto sandwich is very nice..i also have a pesto sandwich on my blog..
Love sandwich!! This one is totally filling and yummy!! Yummy sandwich Vidhya, healthy & delicous! Healthy and filling sandwich ! Delicious pesto sandwich love it. Pesto sandwich looks so good, delicious and healthy too….